“Attenborough and the Giant Dinosaur was a truly moving piece of TV – but it was also the story of a truly massive dinosaur. Unearthed in the Argentine desert in 2013, it is now believed that this plant-eating species – aptly named Titanosaur – is the biggest to have walked the Earth. My eyes popped as Sir David unveiled its 2.4m-long thigh bone, my jaw dropped as experts calculated its 70-plus tonne weight and, yes, my tear ducts moistened as Dr Luis Chiappe relived the moment he saw a piece of genuine dinosaur skin, preserved within an egg shell fragment, for the first time.” — The Independent. “Attenborough brought context, insight and hard-wearing pastel clothing. How such monsters moved was explained using pressure pads and an obliging elephant; the location of their demise was contextualised through a brief history of climatology. Like the construction in the warehouse, it all fell into place. The discovery, he noted, added ‘one further marvel to the astonishing history of life on Earth. '” — The Telegraph. 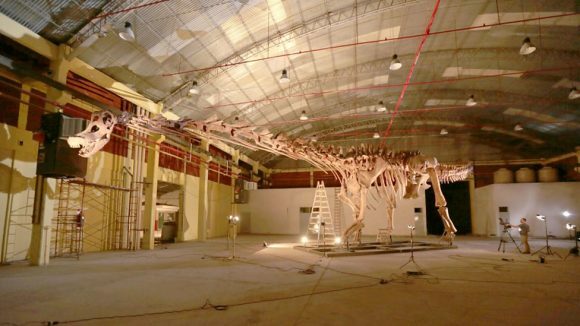 “Britain’s greatest natural historian is overjoyed as a 100 million-year-old titanosaurus is unearthed in Patagonia … ‘Wow,’ says Sir David, walking into the warehouse and looking up. ‘Absolutely amazing. Good gracious.’ Four double decker buses long, almost two high, the largest animal to have ever walked the earth, towering above another ancient great. They haven’t named the beast yet –how about Attenborosaurus?” — The Guardian. “The most absorbing moments are when Attenborough quizzes Dr Diego Pol, the lead scientist on the excavation, and the evolutionary biologist Ben Garrod about the titanosaur’s life and prehistoric times. This is a subtly different Attenborough film: he’s not the expert this time but the one asking the questions – and delighting in the learning. The 37m-long model skeleton unveiled at the end, like the best Lego kit ever, is pretty impressive as well.” — Irish Times. “Although easily understood and visually resplendent, the documentary can seem superficial at times … While engaging, it could have been improved by extended interviews with paleontology experts. Members of the research team gave short statements, but overall, the programme lacked sufficient scientific explanations, especially regarding how the computer model was generated. In addition, if filmmakers had fleshed out the historical perspective of paleontology and the previous dinosaur discoveries, they could have intensified the perceived impact of this finding.” — Yale Scientific Magazine. Watched it. Very good programme. One very big Vegesaurus.